Temporal arteritis is inflammation and damage to the blood vessels that supply blood to the head, neck, upper body and arms. It is also called giant cell arteritis. Temporal arteritis affects medium-to-large arteries. It causes inflammation, swelling, tenderness, and damage to the blood vessels that supply blood to the head, neck, upper body, and arms. It most commonly occurs in the arteries around the temples (temporal arteries). These arteries branch off from the carotid artery in the neck. In some cases, the condition can occur in medium-to-large arteries in other places in the body as well. The cause of the condition is unknown. It is believed to be due in part to a faulty immune response. The disorder has been linked to some infections and to certain genes. The problem may develop with or after another inflammatory disorder known as polymyalgia rheumatica. Giant cell arteritis almost always occurs in people over age 50. It is most common in people of northern European descent. The condition may run in families. The health care provider will examine your head. The scalp is often sensitive to touch. There may be a tender, thick artery on one side of the head, most often over one or both temples. Blood tests alone cannot provide a diagnosis. You will need to have a biopsy (tissue sample) from the involved artery. Getting prompt treatment can help prevent severe problems such as blindness or even stroke. Most of the time, you will receive corticosteroids, such as prednisone, by mouth. These medicines are often started even before a biopsy is done. You may also be told to take aspirin. Most people begin to feel better within a few days after starting treatment. However, you will need to take medicine for 1 to 2 years. The dose of corticosteroids will be cut back very slowly. Biologic medicines may also be used. These medicines appear to reduce the amount of corticosteroids needed to control the disease. Long-term treatment with corticosteroids can make bones thinner and increase your chance of a fracture. You will need to take the following steps to protect your bone strength. Avoid smoking and excess alcohol intake. Take extra calcium and vitamin D (based on your provider's advice). Start walking or other forms of weight-bearing exercises. Have your bones checked with a bone mineral density (BMD) test or DEXA scan. Take a bisphosphonate medicine, such as alendronate (Fosamax), as prescribed by your provider. Most people make a full recovery, but treatment may be needed for 1 to 2 years or longer. The condition may return at a later date. Damage to other blood vessels in the body, such as aneurysms (ballooning of the blood vessels), may occur. This damage can lead to a stroke in the future. Ponte C, Rodrigues AF, O'Neill L, Luqmani RA. Giant cell arteritis: current treatment and management. World J Clin Cases. 2015;3(6):484-494. PMID: 26090367 www.ncbi.nlm.nih.gov/pubmed/26090367. There are four carotid arteries, two on each side of the neck: right and left internal carotid arteries, and right and left external carotid arteries. 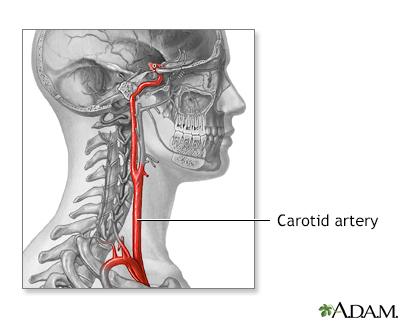 The carotid arteries deliver oxygen-rich blood from the heart to the head and brain.